Want to review your own website? 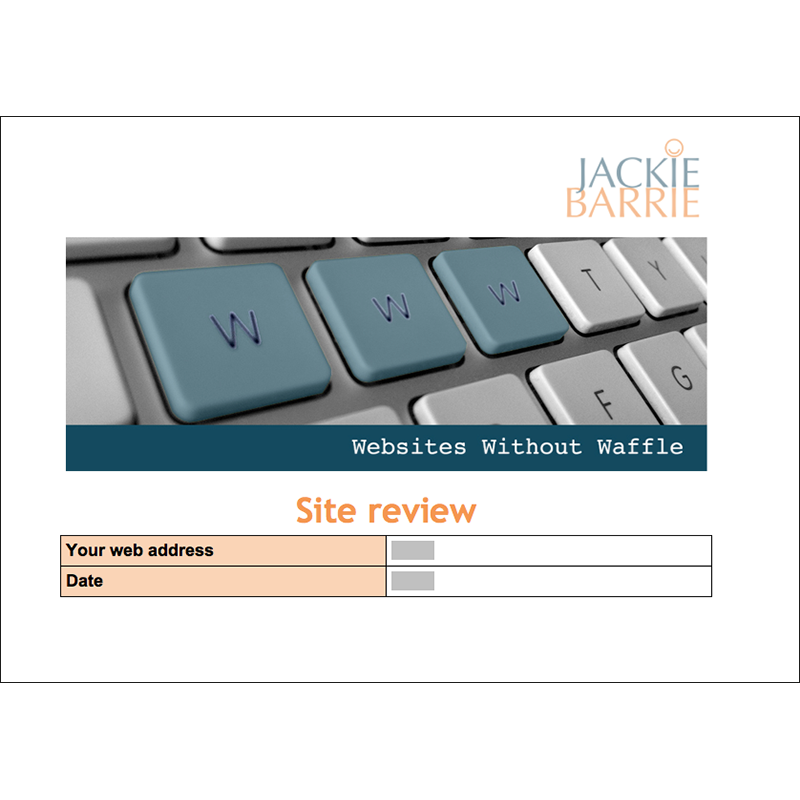 Then use this handy checklist, created from 30 real site reviews by professional copywriter, Jackie Barrie. It covers the essential principles of web layout, web copy, and Search Engine Optimisation (SEO) for the most common web pages. Just tick simple ‘yes/no’ boxes to discover what marketing and psychological tricks your site might be missing. You can then make your own changes to ensure your website performs as well as it possibly can. 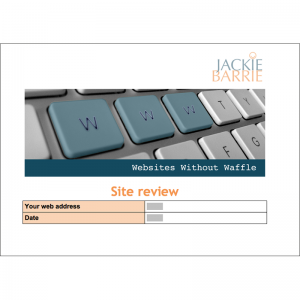 The downloadable document also includes a £25 voucher for you to redeem against copywriting services from JackieBarrie.com. Please scroll down for more details and reviews. This is a digital download for business use. VAT will be added at the checkout, at the current UK rate of 20%. I used this tool to have a fresh look at my website. On the surface it is a simple “tick box” exercise – looking at each element of the website in turn, and very easy to use. However, it also gives important advice on each element, going into evidence-based detail on simple tweaks which can make a huge difference. I learned a lot from the exercise, which also resulted in an action plan of changes to make. The author clearly knows her stuff, and some of the advice surprised me, but made perfect sense. I’d recommend this tool as a good investment for anyone whose business uses a website, whether as a brochure, a shop front or as the business itself. Even small changes can make a huge difference. The DIY Site Review is an excellent tool. I was proud of my site and now I feel like I have an awful lot to do. But that is okay, because for every ‘no’ I scored myself – and I scored myself hard – there is enough explanation for me to understand what I need to do and, more important, why it is important. I did a lot of the copywriting and structuring myself, so now, I can add another layer of professionalism. And if you got your site done by an expert; here’s your chance to evaluate their work rigorously. … or you could be living with them in blissful ignorance. Your choice!